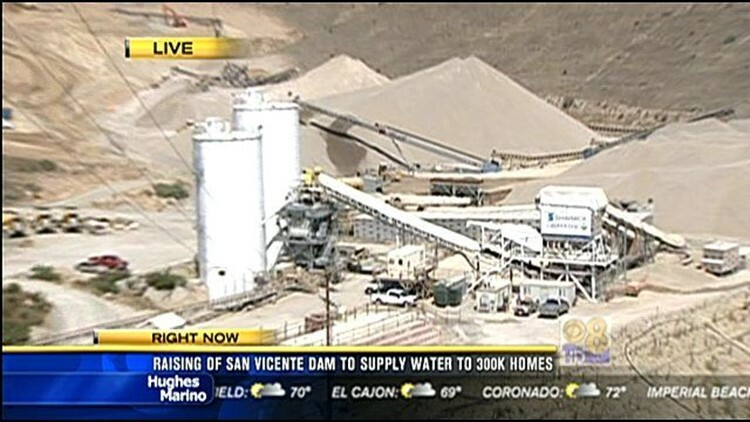 The San Diego County Water Authority plans to show off Tuesday the special concrete mixture that it will use to build a temporary dam to hold back water in the San Vicente Reservoir. LAKESIDE (CNS) - The San Diego County Water Authority showed off the special concrete mixture Wednesday that it will use to build a temporary dam to hold back water in the San Vicente Reservoir. Roller-compacted concrete requires less water and sets faster, speeding along the authority's largest water storage project ever. The SDCWA plans to raise the height of the main dam by 117 feet this fall. The extra water in the reservoir will be able to supply 300,000 homes annually. It will also give the county extra water in case of emergency. Work began on the temporary dam on a small scale last month, but recently the pace of the work has picked up, according to the agency.